Morning fog and afternoon warmth continue through Tuesday. 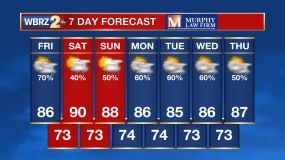 A cold front will bring showers and cooler temperatures for the middle and end of the week. Today and Tonight: The new week will begin with partly sunny skies and an afternoon high temperature in the low to mid 80s. Such numbers are almost 10 degrees above average for early November. Winds will be southwesterly at 5-10mph. Overnight will be partly cloudy and some patchy fog will again be possible thanks to mugginess and light, south winds. Up Next: A repeat warm afternoon is ahead on Tuesday before a cold front moves into the region on Wednesday. This cold front will move slowly and therefore clouds and showers will be possible through the day. Thanks to this, temperatures will not be able to move beyond the mid 70s. 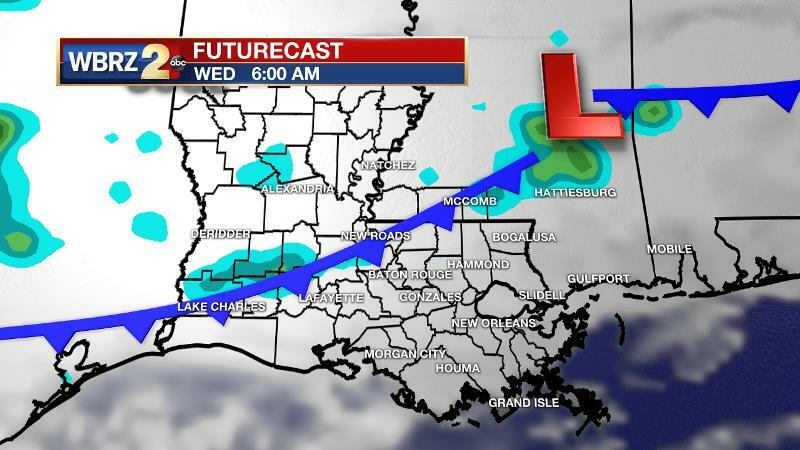 Cooler air will arrive in earnest on Wednesday night as the front slips into the Gulf. Lows will be in the mid 50s on Thursday morning and despite sunshine, highs will stay in the upper 60s on Thursday. Cool mornings in the upper 40s and low 50s followed by seasonable afternoons in the low 70s beneath sunny skies will continue through the weekend. From the Tropics to Severe Weather: Tropical Depression 19 has formed in the central Atlantic. The minimal tropical system could become a weak tropical storm, named Rina, as it accelerates northward out to sea. As a reminder, while we slowly turn attention off the tropics, it is important to prepare and be ready for the second severe weather season. A broad upper level ridge of high pressure ridge centered over Mexico remains in control of the local weather. Some moisture remains from the surface into the lower levels. Temperatures will once again warm into the 80s Monday and Tuesday. Tuesday will be the warmest with mid 80s achieved in several locations. The GFS and ECMWF models have become more consistent in development and timing of the next system into our area. Changes are on the way as an upper level shortwave trough further develops. The ridge of high pressure will retrograde west as the shortwave progressively moves southeast. A front will sag through the area on Wednesday and into the Gulf of Mexico Wednesday night ahead of the main upper shortwave energy. Winds will shift out of the north following the front, which will drop temperatures. The upper level system will bring some positive vorticity advection into our forecast area. At this time, the threat for several weather is minimal, though some showers and thunderstorms will be possible as the front moves through. Along with the chance of rain will come cooler temperatures. With showers and increased cloud cover, highs will be slightly cooler Wednesday but drop into the mid 60s to near 70 on Thursday. Friday and Saturday mornings look chilly with lows in the 50s. Moderation of temperatures is expected through the weekend.